Daniel is a teenage boy with the diagnoses of cerebral palsy and seizures. He has significantly high muscle tone and has had varied success with tone management over the years. If his feet are not strapped to the footplates, he extends at his knees and his feet are then hanging far in front of the footplates. 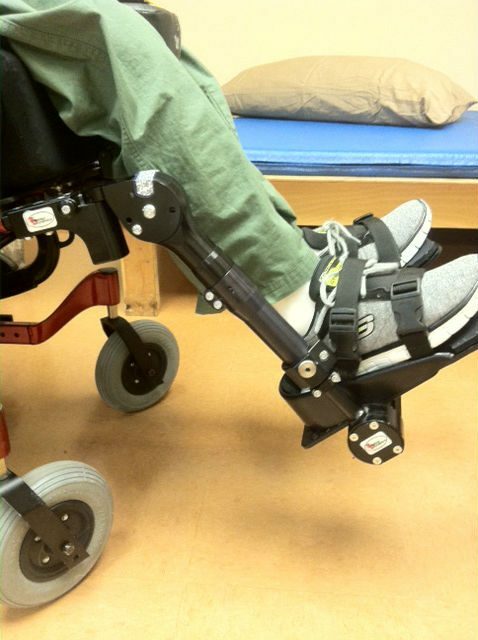 This increases the turning radius of the wheelchair, places his lower legs at risk of injury, and leads to a loss of position of his pelvis. As a result, his feet have been strapped into shoeholders for most of his life. This positioning has kept his feet on the footplates, but has created other issues. Within his static seating system, and with static wheelchair footrests, Daniel’s extension was somewhat controlled by the flexed position he was held in. However, he did continue to extend, leading to significant forces being exerted against static support surfaces. I have observed that when a client extends against an unforgiving surface like a static wheelchair footrest, this often leads to a further increase in tone. In Daniel, this led to significant forces occurring through his joints, in particular, his knees. These forces led to Daniel’s knees becoming chronically red and swollen. Daniel eventually experienced a hairline fracture of the lower right femur and had some tendon tearing bilaterally below and lateral to the knees. His orthopedist diagnosed Daniel with Osgood-Schlatter disease and recommended that Daniel be positioned in increased knee extension to reduce force through the knee. We needed a solution and fast! Daniel trialed Dynamic Footrests. He immediately indicated a preference for these over his static wheelchair footrests. He was able to readily extend at the knee, diffusing forces and protecting the knee joint, and then return to a neutral starting position which kept his feet on the footplates and not extended in front of him. With his own Dynamic Footrests now in place (in combination with a Dynamic Rocker Back), Daniel can tolerate sitting in his wheelchair for longer periods of time, his overall extensor patterns are reduced, and his knees are no longer red and swollen. His family believes his dynamic seating components are a key part of his wheelchair seating system.